A new older sibling introduces baby sister to readers. 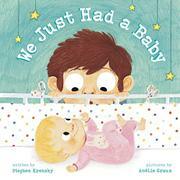 New-baby picture books abound, and they often hinge on conflict arising from an older sibling’s trouble adjusting. Not so in this milquetoast offering from Krensky and Graux. The unnamed, first-person narrator describes initial ambivalence, which then suddenly shifts. The child goes from feeling a distancing pride in what big kids can do as opposed to what the baby can do (eat pizza and ice cream, use a toilet) to eventual engagement with the baby and hopes for how they will play together once she gets older. Splashing together in the bath and playing peekaboo are the turning points, but there’s never much of a hook to pull readers into the story; indeed, there’s never much of a story. Meanwhile, Graux’s soft illustrations overemphasize the characters’ eyes to display emotion and reiterate the textual statements without doing much to extend the narrative. The family is white; the parents are heterosexual; there’s nothing to set this book apart.